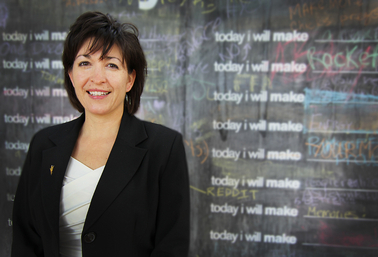 Dean Montoya’s call to action is to get involved and after you read her speech, you’ll know why. We don’t usually post talks but this is one we wanted to share. Here’s Mitzi Montoya…. In my talk I’m going to give you something to think about and challenge you to what we can do next. People ask me how I got to where I am. When I was little, I wanted to be an astronaut, a neuroscientist, a neurosurgeon, and a psychiatrist. Those were the “STEM-y” things. How we get to where we are is an interesting piece of what drives us. It’s some of what we need to think about from a STEM standpoint. So that’s my worry. One of the things I think we have to think about is what STEM is. It’s about innovation. And it’s not just about getting a degree in Science and Technology, Engineering and Math. It’s about being STEM literate. That’s the foundation of future innovation and innovators. So who are STEM rock stars? These are people who make a difference and they make things that matter. They also create cool stuff and build solutions to real world problems. They can be real rock stars because they make the world a better place. So what do STEM rock stars do? They create innovative design and solutions. In the year 2050 the world population will require 20% more food. 70% must come from efficiency and improving technology but we don’t have the land, the water, or the technological capability to feed the world populations. That’s STEM. But it’s not just stuff. It’s about creative experiences and innovative services which are everything from entertainment to the healthcare industry. Many of us watched the Oscars. What fantastic technology that went into the making of, for example, Gravity. It’s an incredible illustration of innovative STEM discipline. But so is the Mayo Clinic or salesforce.com that made real the concept of cloud computing. So why are we talking about STEM? In the next 10 years, 80% of the fastest growing occupations will depend on skills in the hard sciences, i.e. STEM, and the social sciences. Why does it matter that we talk about this in relation to women? First the good news. 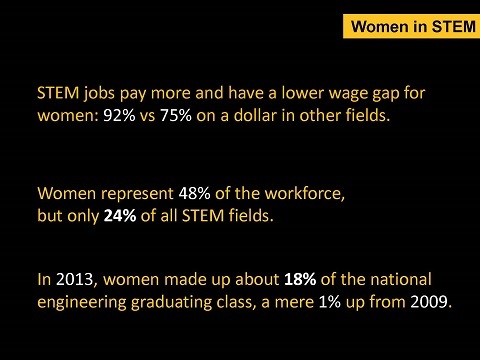 STEM jobs pay more and have a lower wage gap for women…92% vs 75% on the dollar. I’m still not happy with this. I’d like it to go to 110%, but it’s better than 75%. When you include the life sciences, the women have made significant progress. So what’s the problem? When you look at the STEM side, women made up only 18% of the national engineering class last year, up only 1% over 2009. But wait it gets worse. 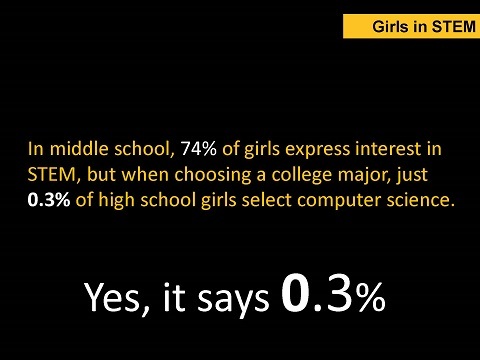 In middle schools 74% of girls express interest in STEM but when choosing a college major, just 0.3 % of high school girls select computer science. We’ve had a lack of women in leadership positions in the hard sciences because we have that pipeline problem. For the ones that we do have there, we have a leadership promotion problem which exists in many fields and it’s still very real in the STEM discipline. The issues of women in STEM is socio-cultural. It’s not K-12’s fault. It’s not the university’s fault. It’s not just ‘those guys.’ It’s all of us. Let me give you another stat. In Malaysia, women’s representation in computer science is 83% because it’s considered women’s work. It’s using a computer. That tells us that there is nothing wrong with women. It tells us we have a socio-cultural problem. 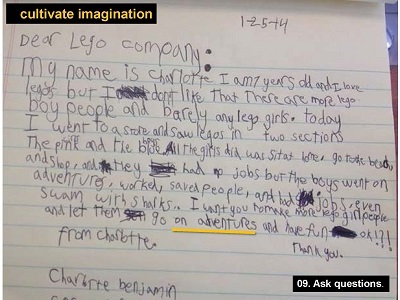 There’s an old Lego ad from 1981 that shows not just what a girl has made but how proud it’s made her. It’s the look you will see whenever children build something. And none of those things are pink by the way and they didn’t have little people. You just made stuff. Somehow this got segmented into boys vs. girls. This is a direct ask and request. This is exactly what we need to hear more, especially from women young and old. Experiences mold us. They teach us through failure. They teach us that it’s not a simple one-off experience, but the more you do it, the more you become competent doing that thing whatever it is. Music is the best example. The first time you look at an instrument it was hard. It only becomes good by repeated practice. Some of you know I rebuild cars. That’s my 16-year-old and my dad on the right in the photo. 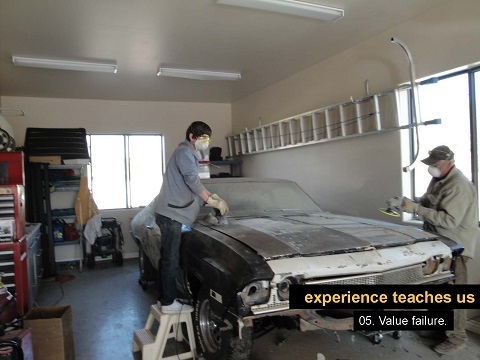 They spent almost two-and-a-half years working on the car project. It created a skill where my son has the ability and confidence that he can fix it. Same with my older son who is 20. Competence and confidence both come from having the dream, the vision of what you want to be and working at it. Everyone starts out as a novice. Competence emerges only out of hard work. As people achieve confidence it feels really exciting to be good at something and to know it. Experts are always aspiring, always learning, always practicing, and anyone that’s not, is not an expert. That competent feeling you get gives you the power that you need to be resilient. 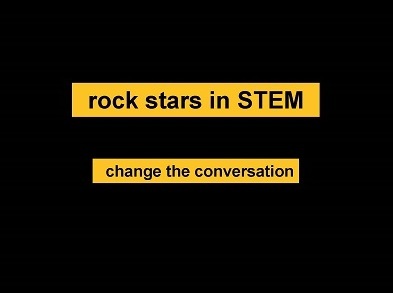 So I would ask you to think about Rock Stars in STEM. 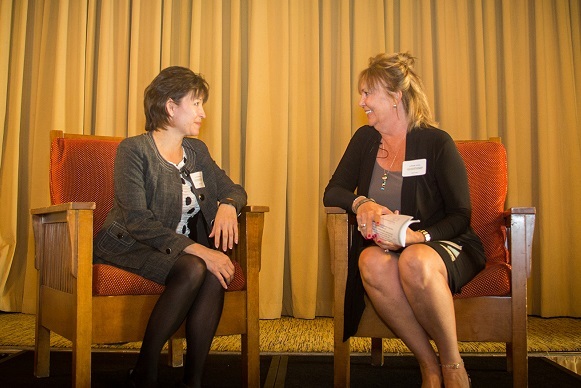 It’s about innovation and how we can change the conversation. My call to action is for you to engage in your community, your circle, your network and change this conversation for women about STEM. Whatever you do, my ask is that you do something. It’s the only way we drive cultural change. 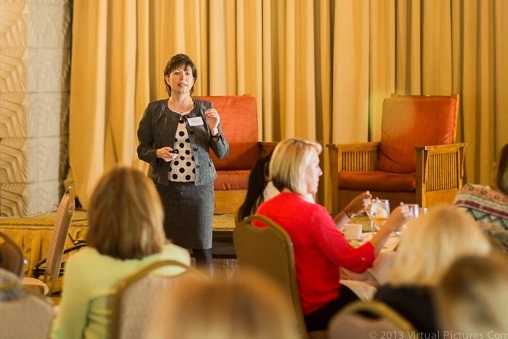 TWE: Thanks, Dean Montoya, for letting us share your important talk and call to action! Check out also our post on She++ about a community of women who are proactively spreading the word about STEM.